You are here: Home / Blezard, Sharron / Get up and eat! Theme: Because they believe in and find their being in Christ, God’s faithful and generous people do not hunger for food that will not satisfy. Ever had a time in your life when things didn’t go as expected? When you thought you’d done pretty well for yourself, but those around you don’t seem to agree? Most of us have some sort of experience that falls in that category, and can say with certainty that it’s not a lot of fun. Now multiply that feeling like the loaves and fishes, and you begin to get a sense of Elijah’s mood. In Chapter 18, God’s prophet has soundly defeated (actually, obliterated) the prophets of Baal, after which (with the benefit of the LORD’s hand on him) Elijah girds his loins and runs in front of King Ahab all the way back to Jezreel. He’s feeling mighty fine about everything; the false prophets are dead, the drought is ended, God is glorified. All’s right with his world—until Queen Jezebel receives the news of the untimely demise of her religious leaders. Elijah’s elation is quelled by the queen’s message that she intends for Elijah to suffer the same fate within a day. Filled with fear for his life, Elijah high-tails it to Beer-Sheba, leaves his servant there and heads a day further into the wilderness where we join him in his journey. His mood has plummeted so far that he lays down under a lone broom tree and asks to die. Clearly we’re missing a bit of motivation for the mood swing, unless it’s simply an acknowledgment that if he’s going to die he’d rather do it on his own terms. Fortunately for Elijah, and for us today, that is not the end of this story. God provides. An angel wakes him up with an invitation to eat and drink—real provision for a hungry and tired body. Even after being fed, Elijah can’t muster up enough energy to get on with life and falls back asleep. This does not deter the angel, nor the God of Israel. Again, provision is made in the form of cakes baked on hot stones and a jar of water. 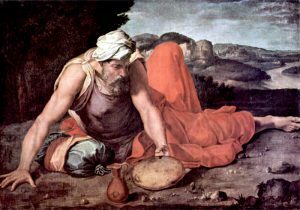 This time the prophet does as he is instructed and heads to Horeb, where those who read ahead a few more verses find out that Elijah meets God, ends his pity party, and receives his next assignment. So why this week’s snippet? What’s the lesson and where’s the gospel to be found for us today? In a nutshell it’s that God provides. This provision is more than just cakes and water, although daily bread is that for which we pray. God responds with exactly what Elijah needs at that exact moment: physical nourishment and direct instruction about what to do and why (19:8). The God of the Cosmos is right there with him, sending an angel to minister to him, and not letting him give up. That same God is with you and with me—with all of us—coming to us in the bread and wine of Eucharist, in the living bread of Jesus working within us to strengthen us for the journey. The Holy Spirit is equipping us to keep on when we’re too weary, putting siblings in Christ, angels unawares, in our path to show the way and encourage us. We need not murmur or lay down to die, giving up on ministry, mission, the beloved community, or this beautiful broken world. Our job is to listen when Jesus speaks: “I am the bread of life.” Yes, get up, eat and drink your fill of Jesus. Otherwise the journey will be too much for you. On the strength of bread from heaven we have enough, are enough, and can do enough and then some for the sake of this very good news we share. Eat up, disciple! We have a journey ahead of us and God is with us. Consider a multi-voice reading of this week’s psalm (34:1-8). Better yet, with a little advance planning, you can turn this into a witness/story sermon. Assign volunteers one or two verses of verses 1-7 and invite them to share a brief story of how they’ve experienced the content of the verse(s) in their own life. Intersperse each story with the chorus of “I Will Bless the Lord at all Times” by James Moore. Finish with the entire hymn. 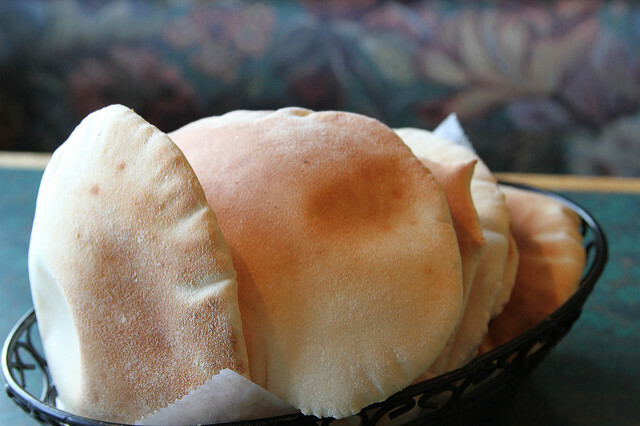 If you’re following the Johannine “bread series” with your own bread, this week’s suggestion is homemade pita. Made in ancient times on hot stones or in small outdoor ovens, it might resemble the cakes Elijah was served, and it’s actually not difficult to make if you have a pizza stone. Click here for a recipe and here for some history. Get Up! Eat and Drink! Ask the children if they’ve ever been so hungry that they just didn’t think they could go on or do anything—hungry enough to die, even. Most of them will not likely have been even close, although you may have some families that are food insecure, so do be sensitive to that fact. We need food to be strong enough to work, study, think, exercise, and live well. What other kind of food and drink do we need to live life well? 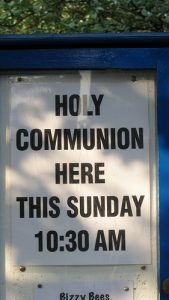 Point to the altar if you have communion prepared there. Tell them that Jesus as the Bread of Life strengthens and nourishes us spiritually, so that we can live the lives that God intends for us. Because Jesus feeds and nourishes us, we can in turn feed and nourish others with both real food and with the good news. Finish with a simple prayer. “Get up and eat, otherwise the journey will be too much for you,” said the angel of God to Elijah. We need to get up and eat, too! Every time we come to Christ’s table we are strengthened for the discipleship journey. This week ponder how you can be a better steward of this precious gift of real and lasting life. Take some time this week to learn about hunger in your community. Click here to learn more. If a person is food insecure, it is hard for them to focus on spiritual things, or even on other aspects of daily life. What ministries do your congregation and community offer? How might you take part? Better yet, how can you work to address the root causes of hunger? Check out ELCA World Hunger and Bread for the World for more ways to make a difference. Photos: hungry dudes, Art in the Christian Tradition, and tnarik, Creative Commons usage license. Thanks!